As the clock ticks down the seconds left, the game starts to come to a close. While it might end on the court, it’s only just the beginning. What is “it”? Not the WNBA Finals, but rather something more sentimental. This something is the emotion felt in EagleBank Arena, the arena both Mason and the Washington Mystics call their home, even if it was only for one game of the Mystics’ most important series in their franchise history. There’s something special about hosting this kind of event–it produced the emotion that was brought to campus, the emotion that was generated on the court from these players and the emotion that will stay with these players as they leave this university. All of these emotions will not be forgotten by the students that attended, the players who performed at their best and the faithful fans who stuck it out until the end. It did not take long before EagleBank Arena added more to its history. 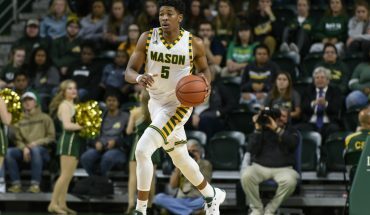 For the first time, Mason hosted a WNBA game, which just so happened to be Game 3 of the WNBA Finals. Furthermore, Courtney Paris, a center for the Seattle Storm, suited up on Wednesday. If that name sounds familiar, it’s because her NCAA single-season rebounding record was broken by Mason center, Natalie Butler, last season on this very court. 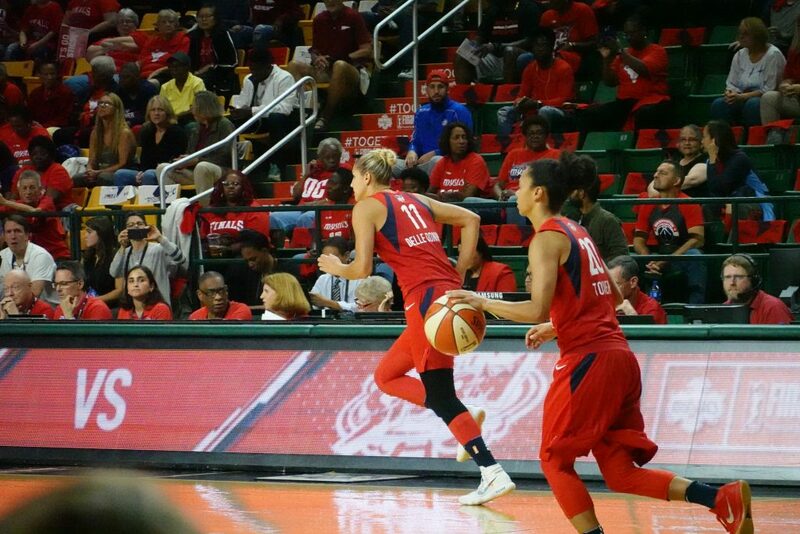 As the Mystics took on the Storm in the WNBA Finals at EagleBank Arena, they didn’t win their first title, but rather gained valuable playoff experience that will help them next postseason and the next time they make it to the Finals. The Mystics came to Fairfax after advancing to their first WNBA Finals in franchise history, after tying the franchise record for regular season wins with 22. Home court advantage was not really present throughout the postseason for the Mystics. While their main court at Capital One Arena was being renovated, they were temporarily moved to the Charles E. Smith Center on the campus of George Washington University. 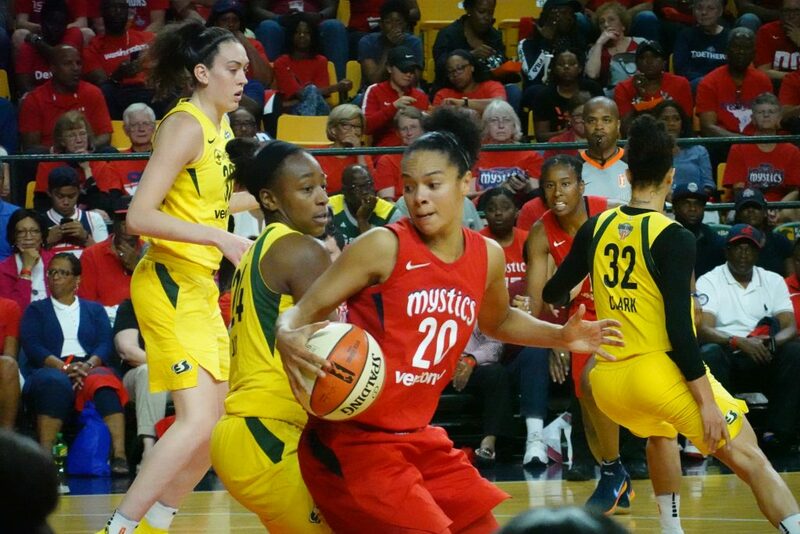 Being subjected to these arena changes at the beginning of their postseason and having to move again to Eagle Bank Arena did not help the Mystics. Going into Game 3, the Seattle Storm were 0-7 on the road in the postseason, their last playoff road win came in 2010 to sweep the Atlanta Dream to win their second championship. The Mystics were also going up against history, every team in the Finals since 2005 to have started 0-2 has been swept by their opponent. e Storm almost didn’t make it to DC. The Storm led their series 2-0 with the Phoenix Mercury before the series moved to Phoenix. The Mercury won Game 3, 86-66, and despite having eleven assists, Seattle’s starting point guard Sue Bird failed to score a point. 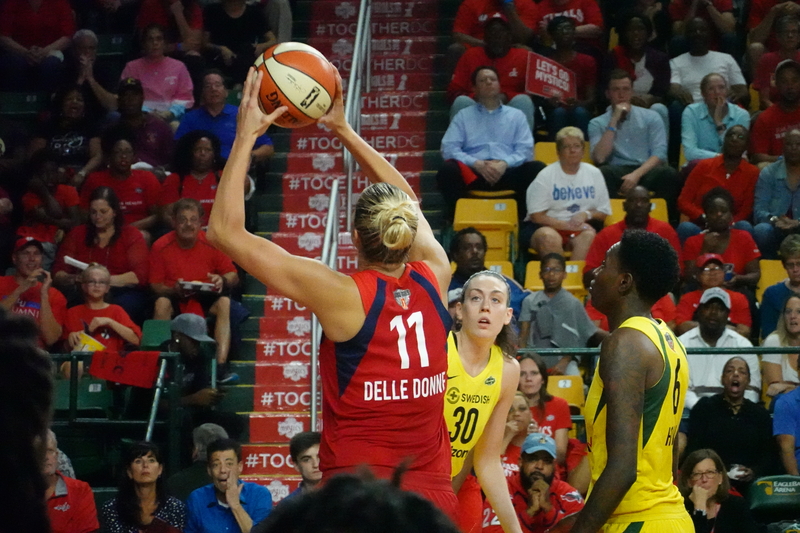 Bird was off to a much better start in Game 4, but during the second quarter teammate Breanna Stewart inadvertently elbowed her in the face. Despite travelling with three masks, Bird wasn’t able to re-enter the game as her nose wouldn’t stop bleeding. With just under six minutes to go in Game 5 of the Semifinals, the Phoenix Mercury led 73-69. That was until Bird decided she wanted to reach her third Finals. With 5:48 to go, Bird hit a three to pull the Storm within one. 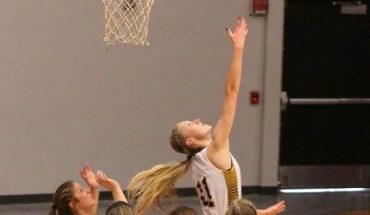 She would go on to score 14 points, going 4-5 from behind the arc before the end of the game. The Storm went on to win by 10 and advance to their third Finals in franchise history. Led by stars like Stewart and Bird, the Seattle Storm to came together and won this series. In addition to her first WNBA Championship, Stewart won the regular season MVP and Finals MVP and is currently undefeated in WNBA Finals games. Bird earned her third championship win (2004, 2010, 2018), adding to her extensive list of accolades over her seventeen years in the league most notably, 11 WNBA All-Star selections, and four Olympic gold medals. During the press conference after their win, Stewart was asked what she had learned from Bird during her time here at Seattle. “I say everything, and it’s honestly true,” said Stewart in regard to what she had learned from Bird during her time with Seattle. Stewart and other players have inspired many communities to be involved and engage more with the WNBA and women’s basketball. 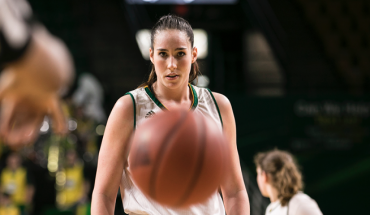 The Mason Women’s Basketball team had a chance to meet some of the players from both teams on Wednesday morning at the shoot-around and while the WNBA Finals may be over, the emotions brought to the arena and pride that came out of them will never be forgotten. Considering Study Abroad to Mason Korea?